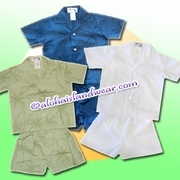 Hawaiian Cabana boy set - Hawaiian baby cabana set, infant aloha shirt. 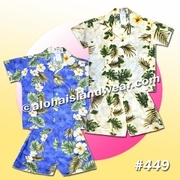 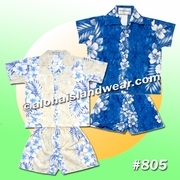 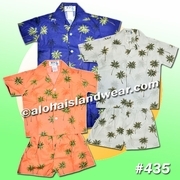 Hawaiian print boy cabana sets are made for toddler and infant wear, this boy set is a complete set of boy Hawaiian shirt with a matched boy short, we offer huge selection of Hawaiian tropical prints for these boy aloha outfits, great Hawaiian wear for Hawaiian beach wedding, family reunion matching apparel, luau clothes, school outfits. 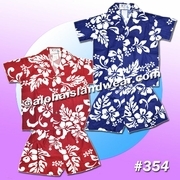 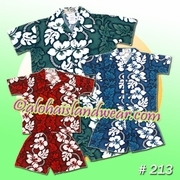 Matching Hawaiian shirts, Hawaiian dresses and girl aloha dress are also available for most patterns.